Congress’ ‘Bitcoin Sign Guy’ has not only accrued almost $16,000 in tips but also spawned an Ethereum impersonator. 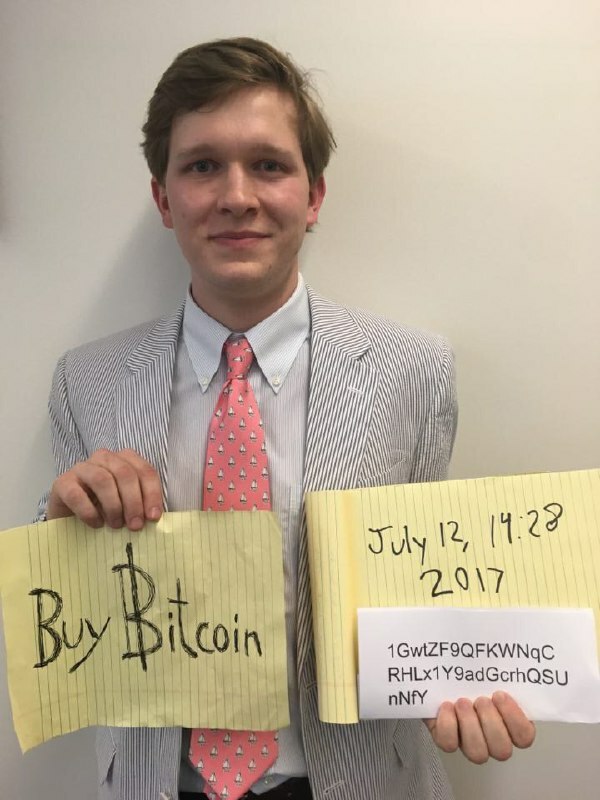 ‘Bitcoin Sign Guy’ has received donations totalling almost $16,000 since his “buy Bitcoin” ‘photobomb’ went viral Wednesday. The as yet unnamed man caused a sensation after holding up a sign with the call to action behind Federal Reserve chair Janet Yellen as she was testifying in Congress on the current condition of the US economy. Donations as gestures of thanks immediately started pouring in, the address provided by Bitcoin Sign Guy in a subsequent photograph having collected more than 6.76 BTC ($15,750) at press time. The move was widely reported even in mainstream media including CNBC, a publication which itself has issued several glowing appraisals of Bitcoin in recent weeks. Meanwhile, an imitation making use of the original Congress footage continues to make the rounds on social media.